This past Friday night Northeast Championship Wrestling returned to the Elks Lodge in Norwood, MA for a huge night of wrestling action with NCW’s SUMMERS SLAM, headlined by “RIOT” Kellan Thomas wrestling Scotty “Won’t Die” Vegas for the NCW Heavyweight Championship after being voted as the FANS CHOICE in a landslide victory. – “The Maniacal” Jack Krueger w/ Sean Feeney & Big Bully Rezner d. Rob “The Giant” Araujo. – “The Hard Rock Hellraiser” Todd Sople d. Dijack w/ MTE after hitting the whammy bar on the impressive Dijack, making his NCW debut. Two time former Heavyweight Champion Buddy Romano came out to the ring, speaking for the first time since returning to NCW in June. Buddy talked about his past as NCW Champion, as well as his long standing rivalry with Doug Summers. After running down Doug’s business practices Romano then set his sights on Pacifico, who attempted to collect on Summers bounty last month in Bristol. Still standing strong, Romano said it was going to take a lot more than that to finish him off. He was then interrupted by Doc Ozone and his new client “The Masshole” Mike McCarthy, who opted to collect the bounty for themselves if Romano was still standing. – “The Masshole” Mike McCarthy w/ Doc Ozone d. Buddy Romano via count out after Romano’s injured arm prevented him from making it in before the ten count. Following the match Romano was once again attacked by Pacifico- who once again applied his ‘crossface chickenwing’ on Buddy. – The Inglorious Dastards (“Terrible” Tony Caruso & “The Beast” Brandon Behm) d. David & Eddie Loomis to win the NCW Tag Team Championship after Pacifico returned to the ring, stalking and attacking Eddie Loomis allowing the Dastards to capitalize and win the championship. – “All Good” Anthony Greene d. “The Original Showoff” Mike Paiva in their Last Man Standing Match after delivering a devastating piledriver off the top rope onto a table set up in the ring. After their brutal match-up, Greene barely was able to make the ten count, defeating Paiva. – Steve “The Turtle” Weiner & Tomahawk d. Maniacally Twisted (“The Twisted Hatter” Alex Creed & the Shadow) w/ Sean Feeney in tag team action, giving a big win to the debuting Tomahawk. – “The Juice” JT Dunn d. NCW New England Champion “Simply God’s Best” GA West w/ Doc Ozone in a hard fought match. While Dunn believed he had won the New England title West reminded him that this was not a NE title match and that the championship was not on the line. – The Lumberjake d. “Dastardly” Doug Summers with a devastating choke slam, giving LBJ one of the biggest wins of his young career. 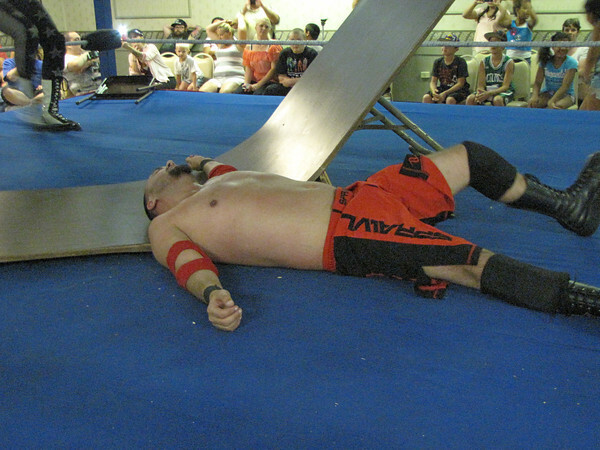 Following the match the Dastards attempted to attack Lumberjake, only to be thwarted by Dean Livsley, who laid out “The Beast” with a big splash. – NCW Heavyweight Champion Scotty “Won’t Die” Vegas d. “RIOT” Kellan Thomas to retain the NCW Championship after Vegas used the ring bell hammer on Thomas behind the referees back. Following the match Kellan and Kepler gained a measure of revenge by knocking the champion down, and celebrating with the NCW Heavyweight Title.